Saving money can be hard for a number of reasons. Often, there is not a large margin between what most people earn and what most people spend. Without some type of strategy, that little bit that's left over every month can be spent all too easily. If you're searching for ways to tuck away a bit of extra savings, these 11 tricks might be the solution. Click through and learn how to strategically increase your savings. Perhaps the simplest way to save without even thinking about it is to set up an automated savings plan. Most financial institutions allow you to set up regular transfers from your checking account to a savings or investment account. Automation is a great way to save because it can be hard for most people to remember to make a savings deposit, let alone finding the will to do it. Automated transfers take that job out of your hands. Once you're on an automated savings plan, the way to really build your savings is to increase those savings by one percent every six to 12 months. For example, if you're setting aside 10 percent of your paycheck, reset it to increase by one to two percent the following year, and every year thereafter. 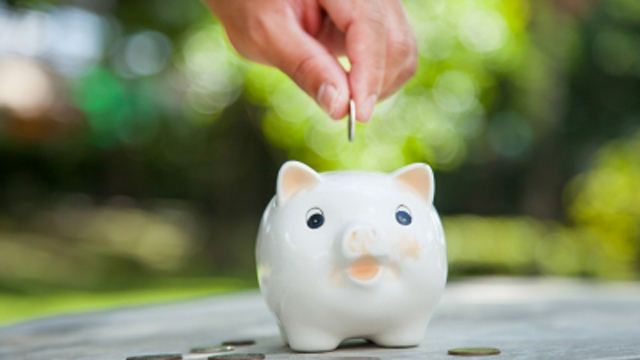 In such small increments, it's easy to adapt to the higher savings level. And, before you know it, you'll save a large portion of your paycheck automatically. A financial services app like Acorns rounds up your purchases and deposits the additional funds into an investment account. For example, if you buy a cup of coffee for $4.58, Acorns will round that purchase up to $5 and deposit the additional 42 cents into your investment account. These amounts are so small that they're not likely to affect your daily life. Over time, however, these small amounts can add up to large savings. If you don't feel comfortable turning over your financial monitoring to an app, no problem -- keep the change yourself. Whenever you come home, whether from a hard day at work or a fun night out on the town, toss whatever change you find in your pockets into a jar. Most people don't like carrying change anyway, so this trick kills two birds with one stone. You'll lighten your pockets, and before you know it -- you'll have lots of spare change saved up that you can deposit into a savings account. This trick involves rewiring your brain to think of extra money as exactly that. Anytime you get a raise at work, a year-end bonus, a cash recognition award or any type of financial gift -- put that money immediately into savings. If you've already been getting by on the money you've been earning, you don't really "need" to be spending this extra windfall. Instead, most people are likely to blow a paycheck on "wants." You can certainly use some of the money as a reward just to satisfy that urge, but the bulk of it should head towards your savings. If you give one of your bank accounts a specific name, such as "Tahiti" or "Maserati," you might be more likely to try to hit savings targets in that account. Naming or defining goals could help you move in the right direction and has proven to be more effective than simply putting money toward that vague category of "savings," according to a behavioral finance concept called "mental accounting." Cash-back credit cards give you an immediate refund on your purchases, typically in the range of one to two percent but occasionally as high as five percent. This savings tip is a bit trickier than the others, as you'll have to be disciplined enough to pay off your entire balance every month to avoid interest charges. Play it safe by simply using your card for cash back and paying it off immediately. To really make savings a priority, don't think of savings as an optional activity. Instead, make it one of your monthly "bills," just like "rent" or "car payment." Also, make it your first priority. Pay your savings account before you do anything else. Then, learn how to make do with the money you have left. This ensures that no matter what happens in a given month, you hit your savings goal. Convenience is great, and most banks now allow you to access your funds 24/7 -- whether via a telephone call, a smartphone app or a web page. Because the best way to save money is to make it hard to spend, put up some barriers between yourself and your money. One option is to open an account in a bank all the way across town. This way, you have to drive to the bank to get your funds. If you have to work hard to get your money, it can help dissuade you from spending that money on frivolous purchases. If competition is something that fires you up, get a savings buddy and set up a contest. Establish savings parameters and see who can stick it out for the distance. The winner can get a nominal prize, such as a free lunch, or you can just award a badge of honor so the savings game doesn't cost anything. In the end, you'll both be winners, as you'll have saved during the competition. How many times have you had buyers' remorse after you buy something? Impulse buys are one of the easiest ways to blow money that you should have saved. To help protect yourself from this common tendency, give yourself at least 24 hours before you make a purchase, especially a large one. This waiting period will help you weed out "wants" from "needs" -- which should provide some clarity about the way you spend your money.